They were once mocked for their intense interests in computers, comic books and video games. Yes, we are talking about geeks, and their upcoming holiday to celebrate everything that is geeky. So, mark your calendars kids, because July 13th is “Embrace Your Geekness” Day, and it recognizes the uniqueness of being a geek. AWW C’MON…you know geekness is cool — don’t ya? Who doesn’t want to be non-mainstream??? Who doesn’t want to be called an expert??? Who doesn’t want to be known as tech savvy??? But, of course, we’re not. That’s why we are so fortunate to have Safety Harbor Computers in the village to clean out all our cookies, gives us more ram and protect us from those nasty viruses. 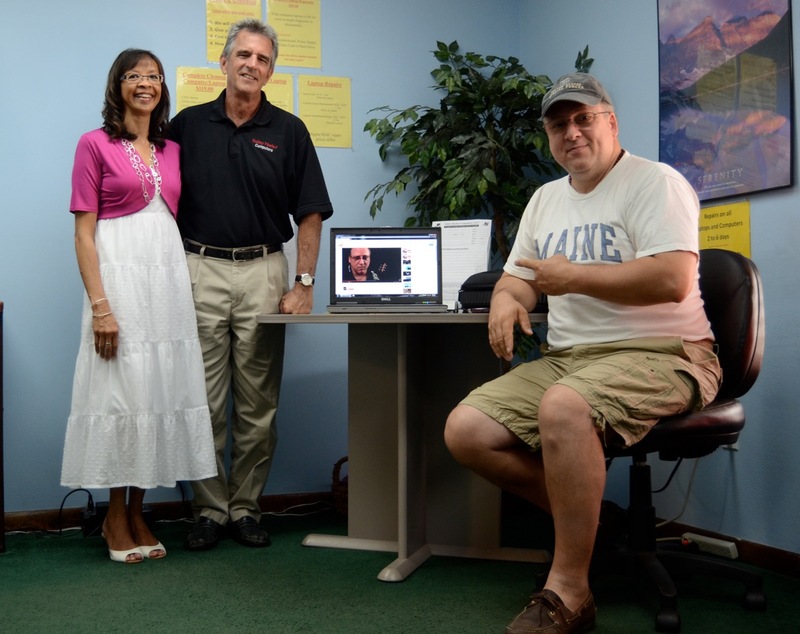 Pictured here are Scott and Maggie Mascitelli, owners of Safety Harbor Computers, with one of the many villagers they rescue, Michael Marth. He relies on them to keep his computer running smoothly, which helps his business of music instruction and studio production. They have been in the village for over 16 years, and they service both residential and business systems. They are all “geeky” y’all — it means they know what they are talking about! On another note, why not commemorate this day by teaching yourself a new function on your smart phone or computer. That would really help unleash your inner geekness. Or, maybe search to find a new app that will assist you in making your day-to-day life a bit easier. July 13th is all things geeky day…watch a Sci-Fi…download a new dungeon game…visit your local comic book shop…anything geeky will do — celebrate the culture.